"Overseas territories of France" redirects here. For the Euro-constituency, see Overseas Territories of France (European Parliament constituency). "Outre-mer" redirects here. For the historical term, see Outremer. Overseas France (French: France d'outre-mer) consists of all the French-administered territories outside the European continent, mostly relics of the French colonial empire. 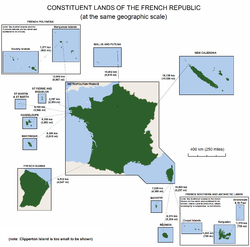 These territories have varying legal status and different levels of autonomy, although all (except those with no permanent inhabitants) have representation in both France's National Assembly and Senate, which together make up the French Parliament. Their citizens have French nationality and vote for the president of France. They have the right to vote in elections to the European Parliament (French citizens living overseas currently vote in the Overseas constituency). Overseas France includes island territories in the Atlantic, Pacific and Indian oceans, French Guiana on the South American continent, and several periantarctic islands as well as a claim in Antarctica. Overseas France covers a land area of 119,396 km2 (46,099 sq mi)[a] and accounts for 18.0% of the French Republic's land territory. It has an exclusive economic zone (EEZ) of 9,825,538 km2 (3,793,661 sq mi) and accounts for 96.7% of the EEZ of the French Republic (excluding the district of Adélie Land, part of the French Southern and Antarctic Lands, where the French sovereignty is effective de jure by French law, but where the French exclusive claim on this part of Antarctica is frozen by a mandatory international cooperation since the signing of the Antarctic Treaty in 1959). The population of all five overseas departments totaled 2,169,000  in January 2018. The population of the overseas collectivities amounted to 621,000 inhabitants (Saint-Pierre and Miquelon , Saint-Barthélemy , Saint-Martin , French Polynesia , Wallis et Futuna , New Caledonia ). The total population of the overseas departments and territories of France is estimated at 2,790,000. Mayotte (since 2011) 1976–2003: sui generis overseas territory; 2001–2003: with the designation departmental community; 2003–2011: Overseas community. In the 2009 Mahoran status referendum, Mahorans voted to become an overseas department in 2011, which occurred on March 31, 2011. The category of "overseas collectivity" (French: collectivité d'outre-mer or COM) was created by France's constitutional reform of March 28, 2003. Each overseas collectivity has its own statutory laws. French Polynesia (1946–2003: overseas territory, since 2003: overseas collectivity) In 2004 it was given the designation of "overseas country" (French: pays d'outre-mer), but the Constitutional Council of France has clarified that this designation did not create a new political category. Saint Pierre and Miquelon (1976–85: overseas department, 1985–2003: sui generis overseas territory, since 2003: overseas collectivity). Despite being given the political status of "overseas collectivity," Saint Pierre et Miquelon is called collectivité territoriale de Saint-Pierre-et-Miquelon, literally "territorial collectivity." Wallis and Futuna (1961–2003: overseas territory, since 2003: overseas collectivity). It is still commonly referred to as a territoire (Territoire des îles Wallis et Futuna). Saint Martin: In 2003, the populations of St. Martin and St. Barthélemy voted in favour of secession from Guadeloupe in order to become separate overseas collectivities of France. On February 7, 2007, the French Parliament passed a bill granting COM status to both jurisdictions. The new status took effect on February 22, 2007 when the law was published in the Journal Officiel. St. Martin remains part of the European Union, as stated in the Treaty of Lisbon. Saint Barthélemy (see the comments immediately above). French Southern and Antarctic Lands (Terres Australes et Antarctiques Françaises or TAAF); overseas territory of France (since 1956). It is currently the only overseas territory. According to law 2007-224 of February 21, 2007, the Scattered Islands in the Indian Ocean constitute the 5th district of TAAF. New Caledonia was classified as an overseas territory beginning in 1946, but as a result of the 1998 Nouméa Accord, it gained a special status (statut particulier or statut original) in 1999. A New Caledonian citizenship was established (in addition to the French citizenship which is kept in parallel, along with the consequent European citizenship), and a gradual transfer of power from the French state to New Caledonia itself was begun, to last from 15 to 20 years. Clipperton Island (French: Île de Clipperton or Île de la Passion, Spanish: Isla de la Pasión) is a 9 km2 (3.5 sq mi) coral atoll located 1,280 km (800 miles) south-west of Acapulco, Mexico, in the Pacific Ocean. It is held as state private property under the direct authority of the French government, and is administered by France's Overseas Minister. With 2,790,000 inhabitants in 2018, Overseas France accounts for 4.1% of the population of the French Republic. They enjoy a corresponding representation in the two chambers of the French Parliament. (Mozambique Channel) Voted on March 29, 2009 in favour of attaining overseas department / region status. That status became effective on March 31, 2011. (Jan. 2017) 18,575.5 15 Sui generis collectivity South Pacific Ocean Referendum for independence occurred on November 4, 2018 with 56.4% voting against and 43.6% voting in favor of independence from France. (Jan. 2015) 25 385 Overseas collectivity Antilles Detached from Guadeloupe on February 22, 2007. (Jan. 2015) 53 673 Overseas collectivity Antilles Detached from Guadeloupe on February 22, 2007. ^ Article 2 of the French Constitution states that the French flag is the only legal flag of France. Only French Polynesia, a collectivity, and New Caledonia, a special collectivity are allowed official flags. This right was granted to French Polynesia by a 6 September 1984, law and to New Caledonia by the Nouméa Accord. The Administrator of French Antarctica is also granted his own flag through a 23 February 2007 ordinance. Historical flags are sometimes used but have no basis in law. Many territories use unofficial flags to represent the territories. The unofficial flags are shown in this table. ^ Land area of the 4 old overseas departments (), Mayotte, the overseas collectivities, and New Caledonia (page 21), the French Southern and Antarctic Lands and the Scattered Islands (), and Clipperton (). ^ "Sea Around Us – Fisheries, Ecosystems and Biodiversity". Retrieved 2018-06-20. ^ "French Caribbean voters reject change". Caribbean Net News. December 9, 2003. Archived from the original on March 18, 2009. Retrieved February 9, 2007. However, voters in the two tiny French dependencies of Saint-Barthélemy and Saint-Martin, which have been administratively attached to Guadeloupe, approved the referendum and are set to acquire the new status of "overseas collectivity". ^ Magras, Bruno (February 16, 2007). "Letter of Information from the Mayor to the residents and non-residents, to the French and to the foreigners, of Saint Barthelemy" (PDF). St. Barth Weekly. p. 2. Retrieved February 18, 2007. On February 7 of this year, the French Parliament adopted the law granting Saint-Barthélemy the Statute of an Overseas Collectivity. ^ "Saint-Barth To Become An Overseas Collectivity" (PDF). St. Barth Weekly. February 9, 2007. p. 2. Retrieved February 9, 2007. ^ "Treaty of Lisbon, Article 2, points 287 and 293". Retrieved January 31, 2008. ^ "Nouvelle-Calédonie", Le Petit Larousse (2010), Paris, page 1559. ^ The population of all five overseas departments totaled 2,169,000  in January 2018. The population of the overseas collectivities amounted to 621,000 inhabitants (Saint-Pierre and Miquelon , Saint-Barthélemy , Saint-Martin , French Polynesia , Wallis et Futuna , New Caledonia ). The total population of the overseas departments and territories of France is estimated at 2,790,000. ^ a b c d e INSEE. "Estimation de population par région, sexe et grande classe d'âge - Années 1975 à 2018" (in French). Retrieved 2018-02-16. ^ a b c d INSEE. "Base chiffres clés : évolution et structure de la population 2010" (in French). Retrieved January 31, 2014. ^ "La population légale au 17 août 2017 : 275 918 habitants". ISPF. Retrieved 2018-02-16. ^ a b c d INSEE. "Tableau Économique de Mayotte 2010" (PDF) (in French). p. 21. Retrieved January 31, 2014. ^ ISEE. "Bilan démographique 2016" (in French). Retrieved 2018-02-16. ^ ISEE. "Tableaux de l'Economie Calédonienne : Population, superficie et densité par commune et province en 2009" (PDF) (in French). Retrieved January 31, 2014. ^ a b c INSEE, Government of France. "Populations légales 2015 des départements et collectivités d'outre-mer" (in French). Retrieved 2018-02-16. ^ INSEE. "Actualités : 2008, An 1 de la collectivité de Saint-Barthélemy" (in French). Retrieved January 31, 2014. ^ INSEE. "Actualités : 2008, An 1 de la collectivité de Saint-Martin" (in French). Retrieved January 31, 2014. ^ STSEE. "Populations légales au recensement de la population 2013 de Wallis et Futuna" (in French). Retrieved January 31, 2014. ^ Ministry of Overseas France. "L'île de Clipperton" (in French). Retrieved January 31, 2014. ^ a b c d e f g h i Délégation générale à l'outre-mer. "Terres Australes et Antarctiques Françaises : Données géographiques et humaines" (PDF) (in French). Retrieved January 31, 2014.